Sony Pictures Animation has just released a first-look photo from the upcoming Hotel Transylvania 3, and it looks like the Drac' Pack is heading out to sea. In the upcoming film, Mavis (Selena Gomez) surprises Dracula (Adam Sandler) with a family adventure on a luxury monster cruise ship which is headed to the lost city of Atlantis. Along for the cruise is Mavis' husband Johnny (Andy Samberg) as well as the creature pals. Check out the picture below. "Mavis surprises Dracula with a family voyage on a luxury Monster Cruise Ship so he can take a vacation from providing everyone else’s vacation at the hotel. The rest of Drac’s Pack cannot resist going along and once they leave port, romance zings Drac when he meets the mysterious ship captain Ericka. Now it’s Mavis’ turn to play the overprotective parent, keeping her dad and Ericka apart. Little do they know that his 'too good to be true' love interest is actually a descendant of Van Helsing, arch nemesis to Dracula and all monsters!" The third installment of the Hotel Transylvania franchise is directed by creator Genndy Tartakovsky, who told USA Today that he took major inspiration for the film from the Chevy Chase National Lampoon's Vacation movies. "It still feels real even though it's so caricatured," Tartakovsky said. "They're funny and they're not the most positive family examples, but you always see a little bit of your family in them." 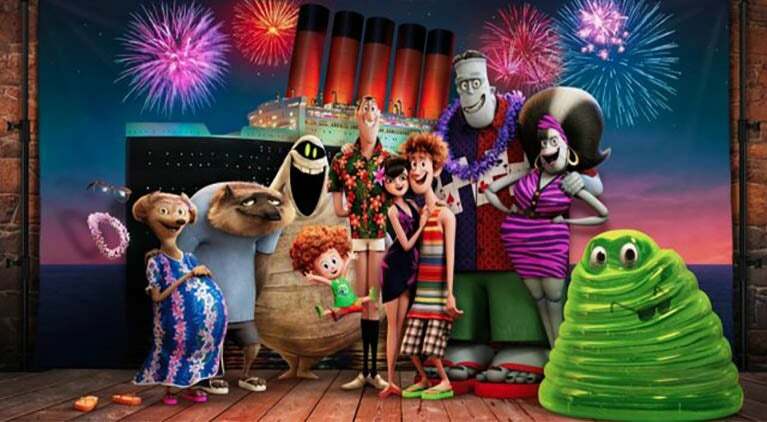 Hotel Transylvania 3 is set to open in theaters July 13, 2018.